A group of ordinary Argentineans head off to a forest retreat to undertake survival training for an impending apocalypse in PARABELLUM, director Lukas Valenta Rinner's narratively stripped-down slice of metaphoric social commentary. Slarek is oddly captivated. As pre-title sequences go, the one that fronts Parabellum, the debut feature from Austrian-born director Lukas Valenta Rinner, is one of the most memorable I’ve been seduced by this year. Consisting of a slowly executed, single-shot circular pan over treetops and countryside, it lasts for far longer than logic dictates that it should and seems to rotate considerably further than the 360 degree limit that current geometry allows. As it comes to rest on an open field, an unspecified something – be it a rocket, artillery shell or comet – slams into the earth and explodes. Cue the main title and a sinister build of the minimalist electronic score. From here we are transported to an office complex somewhere in Buenos Aires in the company of taciturn and dour faced Hernán as he walks back to his office. As he continues work in what looks like one of the dullest admin jobs imaginable, a radio news report talks of rioting and looting, but no one in the room appears to pay it any attention. After work Hernán pays a silent visit to his dying father and drops his cat off at a boarding kennel, and an answerphone message reveals that he’s recently cancelled his phone and Internet package. The following morning he boards a coach and is transported to a riverside location, where he and a number of others are blindfolded and ferried by boat to a remote forest retreat. Here they can relax at night but by day learn the basics of survival, from how to select non-poisonous plants for emergency food to how to handle firearms and disarm potential assailants. They’re preparing themselves for an approaching apocalypse, but are they merely paranoid or is the society in which they have so long lived on the brink of collapse? There’s an undeniably distancing aspect to Rinner’s observational austerity that will likely divide audiences and has already found the film its share of dismissive detractors. There’s certainly no attempt made to bond us to Hernán in the traditional sense, framed as he is in a blend of hand held follow-shots and geometrically framed wides. In common with the other trainees, he also remains vocally silent for almost all of film’s commendably brief 75 minute running time. 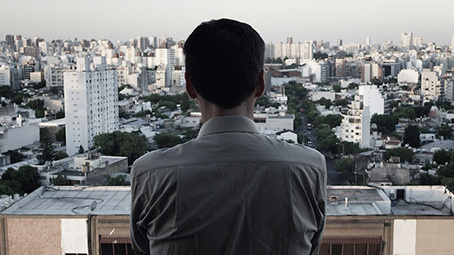 Instead of engaging with Hernán we observe him much as we might if this were a dispassionate work of Direct Cinema documentary, a cinematic form that cinematographer Roman Kasseroller’s precision composed imagery visually distances this film from. Parabellum could be described as depersonalised cinema, a film in which we are invited to view a process from an emotionally detached standpoint rather than engage with it through the more traditional route of character bonding. In this respect Hernán is less a figure of empathy than a point of identification, the one recognisable constant in what is essentially a production line for transforming ordinary citizens into cold-blooded survivalists. And ordinary they are, an unremarkable group comprised largely of middle-aged, unfit and even overweight individuals who could have been randomly selected from any middle-class neighbourhood anywhere in the western world. The issue for many will be that in the process of operating on a largely metaphoric level, the film makes no attempt to explore the mind-set of those who undertake the survivalist training, or to explain what transforms the initially hesitant Hernán into a man who can slaughter a family and then calmly sit down in their living room and eat their food with his comrades. Certainly after the film had ended I found myself reflecting more on what was absent from the narrative than what was present, and I did wonder for some time exactly what I was being asked to take away from the experience. But here’s the thing. While I was watching the film I was consistently hooked, from that circular pre-title sequence to the brilliant and bone-chillingly ominous final wide shot, and at no point did I feel as if I was being short-changed on character or narrative content. There’s more than a whiff of Dogtooth director Yorgos Lanthimos in Rinner’s almost clinical studiousness and there’s even a dash of Michael Haneke in the ease with which bourgeois trainees are able to close all empathic doors and think only of their own survival. As the film progresses there are signs that the apocalypse for which they are preparing may be closer than initially suggested, and as a small group of them head back to civilisation, whatever form it by then may take, my thoughts were not for them but the unprepared unfortunates they’ll likely encounter on their arrival. That Parabellum elects not to emotionally engage us has been a real issue for some, but I long ago came around to the belief that a film doesn’t have to tell a conventional story in the traditional manner to exert an intellectual grip, and that’s certainly what happened with Parabellum and this particular viewer. For all its emotional detachment, it’s an economically told, precisely composed and strangely compelling work, one whose observational formalism is run through with a sly strand of dark humour and is chaptered with extracts from a survivalist instructional manual entitled ‘The Book of Disasters’. My favourite of these has to be “The best way to survive a catastrophe is to become invisible in the eyes of others,” which actually makes a kind of twisted sense. And therein lies the thing that unsettled me most about Parabellum, that I actually might have learned something from the classes we drop in on during the film’s first half. I’m just hoping I never have the chance to try and put any of it into practice. The 59th BFI London Film Festival runs from 7th to 18th October 2015.